Marlins pitcher Jose Fernandez is Monday's Player of the Day. Fernandez pitched eight scoreless innings, gave up only two hits and struck out 10 in the 4-0 win over the Padres. Rays pitcher Matt Moore is American League Player of the Day. Moore gave up no runs over seven innings and struck out nine in the 12-0 win over the Astros. Moore rises to 10th place among players in Box-Toppers points for the season (see the updated top 10 list on the home page). 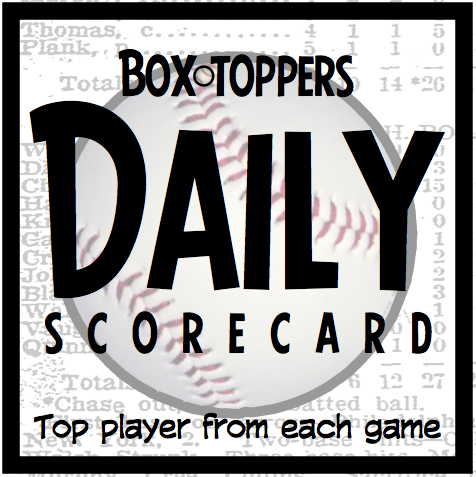 He receives 1.7 Box-Toppers points for AL Player of the Day, giving him 10.4 for the season and is the 12th player this season with 10.0 or more Box-Toppers points. Robinson Cano of the Yankees is AL Batter of the Day. Cano hit two homers and went 3-for-4 in the 10-4 win over the Twins. Todd Frazier of the Reds is National League Batter of the Day. Frazier homered, drove in four runs and went 2-for-3 in the 8-1 win over the Giants. Fernandez receives 2.0 Box-Toppers points for being Player of the Day. Moore receives 1.7 for AL Player of the Day. Cano and Frazier each receive 1.5 for being top Batter of the Day in their league.